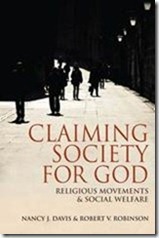 Nancy Davis and Robert Robinson’s Claiming Society for God: Religious Movements and Social Welfare in Egypt, Israel, Italy, and the United States (Indiana University Press, 2012) has been awarded the gold medal in the Religion category of the Independent Publishers Book Awards, which recognize books by university and independent presses. The book also won the Scholarly Achievement Award of the North Central Sociological Association. The book focuses on common strategies used by religiously orthodox (what some would call “fundamentalist”) movements around the world. Rather than using armed struggle or terrorism, as much of post-9/11 thinking suggests, these movements use a patient, under-the-radar strategy of taking over civil society. Claiming Society for God tells the stories of the Muslim Brotherhood in Egypt, the Sephardi Torah Guardians or Shas in Israel, Comunione e Liberazione in Italy, and the Salvation Army in the United States, showing how these movements, grounded in a communitarian theology, are building massive grassroots networks of religiously based social service agencies, hospitals and clinics, rotating credit societies, schools, charitable organizations, worship centers, and businesses. These networks are already being called states within states, surrogate states, or parallel societies, and in Egypt have now brought the Muslim Brotherhood to control of parliament and the presidency. This bottom-up, entrepreneurial strategy is aimed at nothing less than making religion the cornerstone of society. 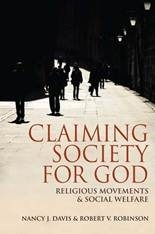 The Facebook page for the book, which includes news stories on orthodox movements and study questions for the book is at www.facebook.com/ClaimingSocietyForGod. This entry was posted in Book Announcements by Jim. Bookmark the permalink.